broken potting table in my yard. I wanted to recreate it in a creative and fun way. It was so wobbly after 10 years outside that I couldn't use it. 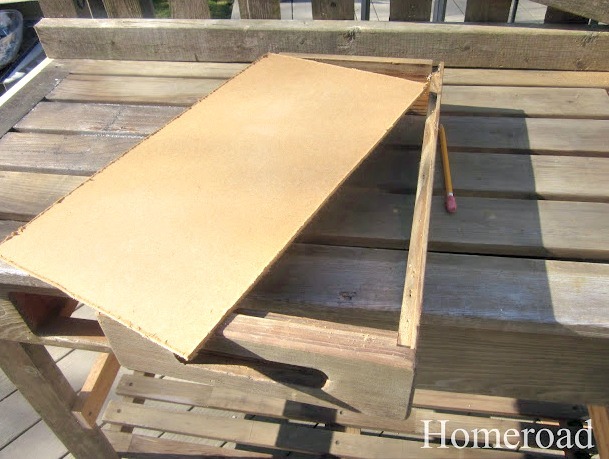 My first step was to make the old potting bench more stable with wood strips across the sides and the back. I had to put the bottom shelf back on because it rotted off years ago. I added old castors from my workshop to the bottom of each leg. The original drawer bottom was gone so I screwed the drawer together and added a new bottom. 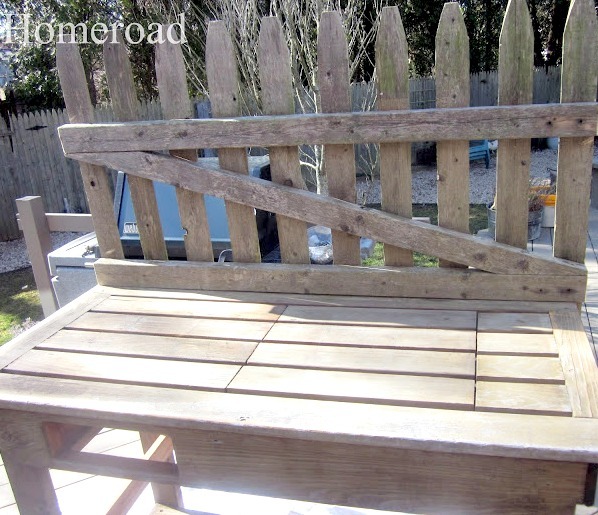 I had an old gate in the yard that I trimmed to the size of the table and attached to the top using a lot of supports and L brackets! Next came the paint, a watered down white wash. When that dried, all the flat surfaces got a coat of Poly. Now I was full on getting creative! I added a "Le Jardin" sign to the front and an old window to one side. I added a galvanized bin on the other side. I had fun adding all kinds of funky hinges, hooks and knobs to hang the tools. 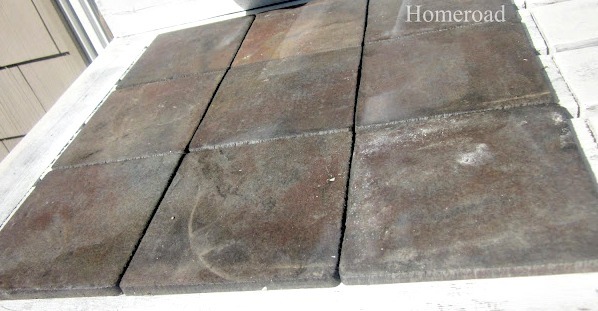 I added slate tiles to create a work surface on the top. 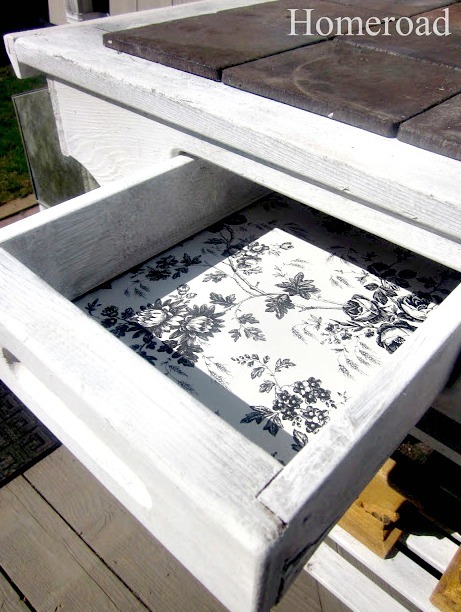 Then the new drawer got a pretty toile liner. 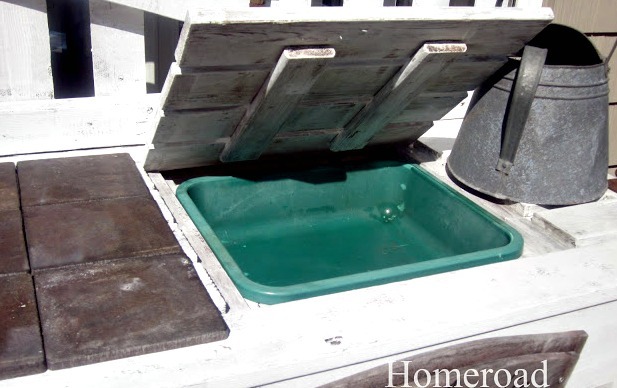 I found the original tray for the little hidden soil holder under the lid. This old potting bench never looked so good! I am very ready for planting this year! how cute is that! LOVE the convience of everything on it. Come to Ohio and build me one, Susan! 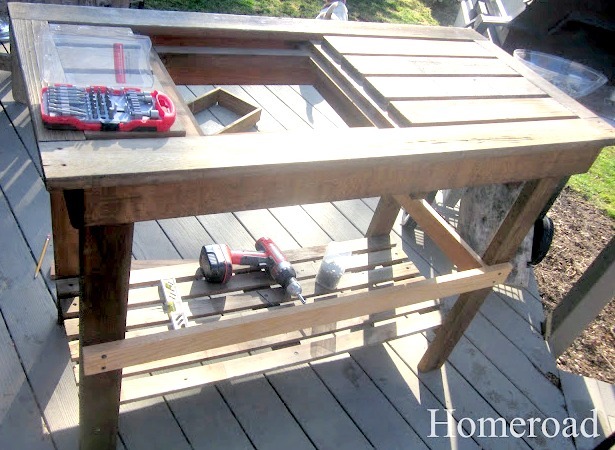 : ) I want a potting bench type table for my sunroom and I'm thinking I may have to go the "build it" route. I love this. It's so cute. I'm aching to have one of these in my backyard. Fabulous! and on wheels too, I love wheels :) Great job Susan! Susan, I *love* this! 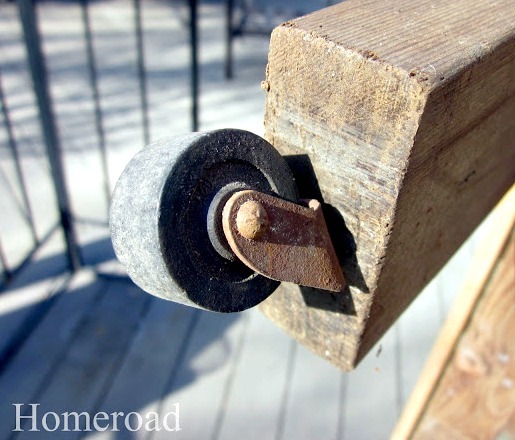 I love anything on wheels, you know--but I think my favorite part are the fun "bits" you added for hanging things! Very clever and cool. You are so creative!! 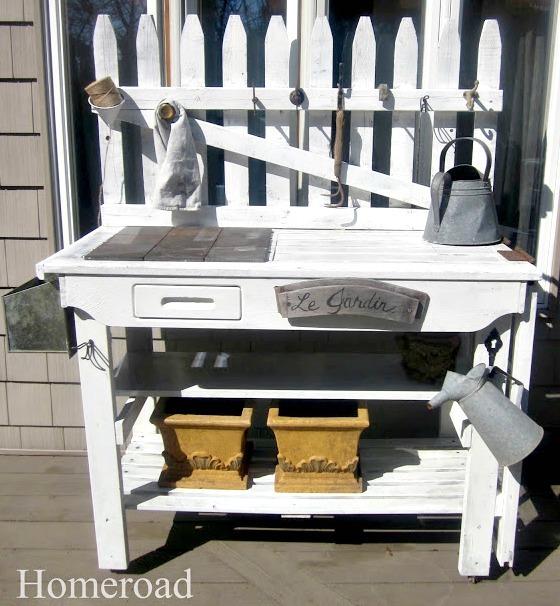 That is a fabulous redo of your potting bench. The pieces and parts you added were pure genius!! I love it! I love it, I will have to bookmark this the for the next potting bench I build! Love it. Wow! this is wonderful :) Great job!! What an awesome make-over Susan! I love it!! Great job, I love it! That truly looks like the perfect potting bench! I love the Jardin sign and the galvanized pieces. I'm sure you'll get a lot of use out if now that the weather is getting better and better! I Love it Susan, wonderful job! Oh Susan, I love this renovation. 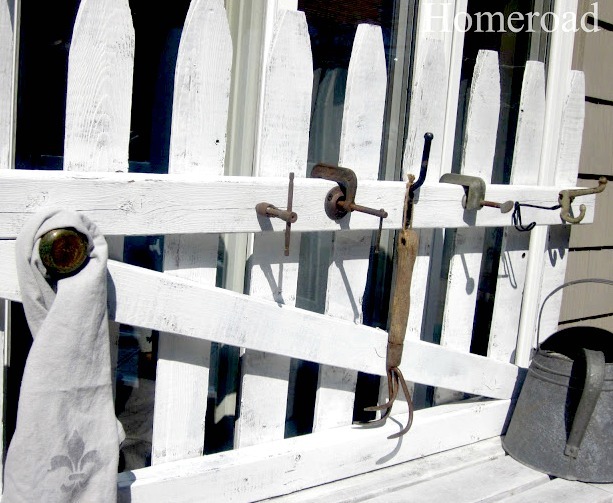 The use of the gate fence, the white wash, the jardin sign and all of the little details make it a unique outdoor piece of furniture. susan i LOVE this! so cute! i love all the hooks and the fresh paint! That is great! I LOVE your blog! Love it! Your funky handles for hanging tools on is great. 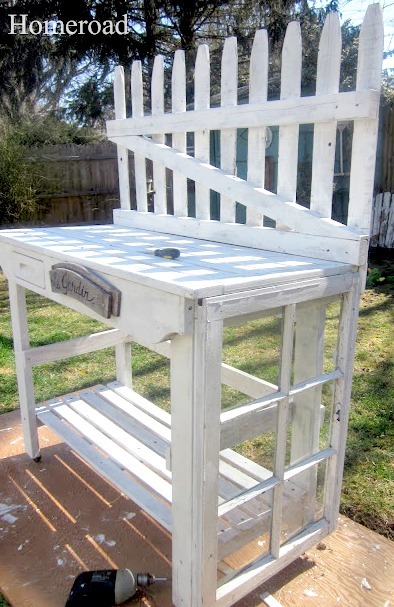 I have an old swing that I'm wanting to turn into a potting bench. Do you really find them useful or are they mainly for looks? Mine is right on the deck! Very handy! A fabulous redo! Love the backing you added and all of your little details, especially the galvanized addition on the side. Happy Spring! Well this puts the thing I pot on to shame! 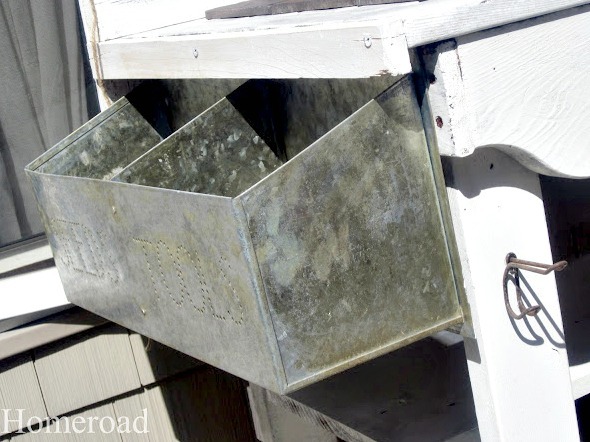 My fav..... the galvanized bins. Ok, I like the window too. The sign on the front as well. And the gizmo's and gadgets for hangers, awesome. Yeah, you made a winner. Homerun, not homeroad! WOW! You really resurrected that table. Super sweet! All the galvanized stuff is awesome too... Now get digging! Hi Susan! You did a fabulous job with this bench!! So awesome!! That is fantastic garden bench! I love it. My hubby and I keep talking about building one, but we get so wet and rainy here in Oregon, I fear it wold only last a season or two before it was dust. LOL. Yours is awesome!! Love it! It is so cute...great job! I want one! Love it! I love this! 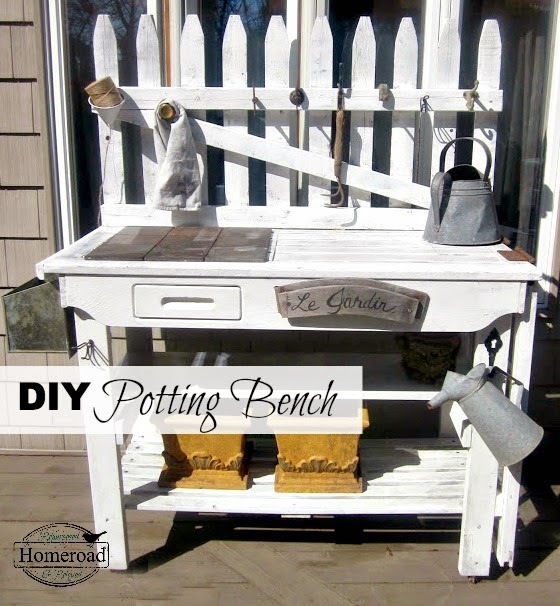 It makes me wish I had an old potting bench to fix up! Oh wow... this is completely amazing! It doesn't even LOOK like you used salvaged pieces! Truly an amazing build. Love all the parts and pieces of this--just fantastic! Hi! Found this on pinterest and I love what you did. Great reuse! You have inspired me to work on updating my potting bench too. Thanks! Thant is fantastic. 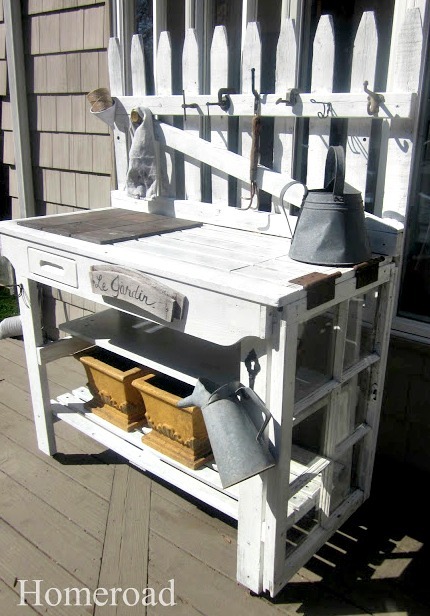 I have always wanted a potting bench...and your is gorgeous! What a beautiful job! Function + beautiful! Love it! I found your post over on Home Talk. I'm a new follower there and now gfc too. I adore this bench. So smart.